A single bottle of Lanson Rose Brut Champagne. This is presented in a wooden gift box and is lined with wood wool. Personalize this gift by adding your own personal message. With a history dating back to 1760 Champagne Lanson is the third oldest house in Champagne and was awarded the Royal Warrant in 1860 by Queen Victoria. Located in Reims, in the heart of France's Champagne region, Lanson is one of the most renowned Champagne houses in the world. 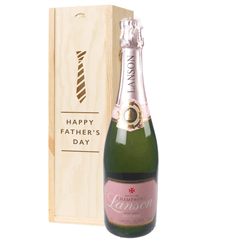 Lanson champagnes are the fruit of centuries of tradition. Their quality stems from the combination of age-old methods with a continually fresh desire to create. Lanson Black Label is a champagne that is loved world-wide. It is created from three grape varieties and aged for 3 years in cellars. It is a great classic that embodies the ideas and the character of a great Champagne House. The White Label blend places an emphasis on Chardonnay at 38%, Pinot Noir at 37% and Pinot Meunier at 25%, without using malolactic fermentation, in order to guarantee freshness and finesse. Champagne Lanson is one of the few houses in the Champagne region that chooses not to use malolactic fermentation, keeping their wines crisp and refreshing. Lanson's non-vintage bruts are blended with a minimum of 30% reserve wines from at least 10 different harvests; this gives our wines a regularity in taste, an intense complexity, and a remarkable depth. We offer a grand selection of Lanson Champagne Gifts in a range of gift packaging.